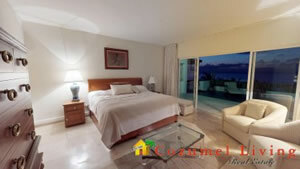 Penthouse in building 1, excellent location and one of the best views towards the beach within Reef Residences. 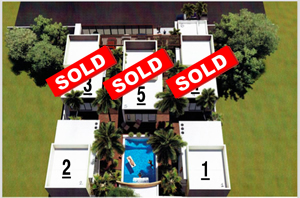 466m2 distributed on two levels plus terraces. 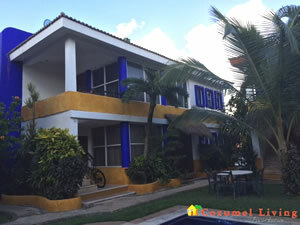 It has 3 bedrooms with option to add a 4th, 4.5 bathrooms, dining room with terrace, closed kitchen, luxury finishes, central air conditioning, private roof garden, terraces and two parking places.The condo has 2 heated pools, one of which is a large infinity pool and jacuzzy, palapas and beach chairs for private use. 24 hours Surveillance. State-of-the-art services, access to the main road, telephone, internet, cell phone service, purified water, water treatment and garbage disposal. 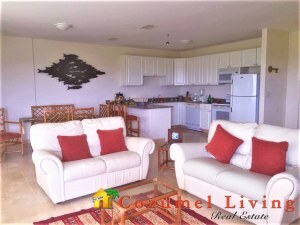 Residencias Reef, the best condominium development on the Island of Cozumel, with more than 200 feet of exceptional beachfront with magnificent views of the sunset. 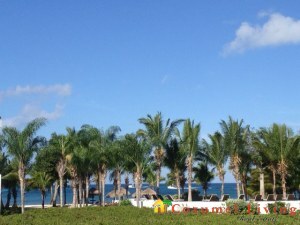 A place that combines exclusive tropical life with the white sand beach and the turquoise waters of the Caribbean. Only seventy-six condominiums distributed in four buildings of three floors each. They are located in the Zona Hotelera Sur at Km. 14, just 20 minutes from downtown where you will find a mixture of wonderful shops and restaurants; right on San Francisco Beach, the most beautiful beach in Cozumel. Only 5 minutes by boat from some of the best reefs, it is perfect for beach lovers. Unit 8170: Very nice rental located in Building 4 on the ground level. Small, yet has everything a single or a couple could want. So much more private than a hotel and it provides a full kitchen with Stove, oven, refrigerator, microwave, and fully supplied with dishes, pots and pans, and utensils. The studio comes fully furnished. The unit actually sleeps 4 with a sleeper couch and bed. Construction: 74.25 m2 or approximately 800 s.f. 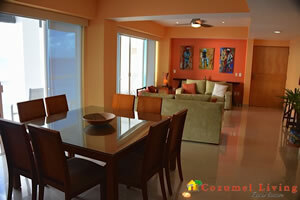 Unit 8180: Beautiful ground floor vacation rental in Building 4. 2 bedroom condominium. 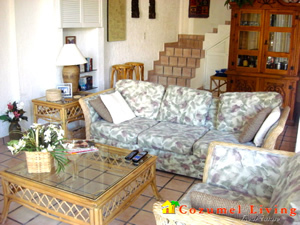 Garden view, steps away from the beach and the 2 swimming pools on the grounds. Large terrace perfect for outdoor living. 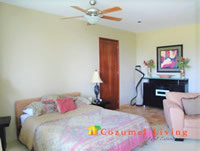 Fully furnished and ready to be yours or to rent out as an income producing vacation rental. $500,000 USD FOR BOTH UNITS! 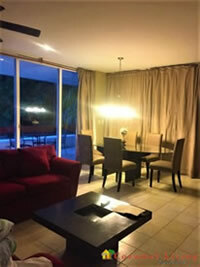 Large condo with private elevators to 11th floor. Condo has a patio balcony all across the front, new Inverter minsplits in every room. The Dining Room has formal dining for 20 people. Fully appointed kitchen with top of the line appliances. Bar area has dishwaher for crystal, wine refrigerators, etc. Nice wood built ins. Large office with storage. Monthly maintenance dues per month. Rents well at $11,000 per month. 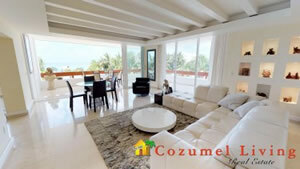 Just 10 minutes from downtown San Miguel, Palmas Reales is located along the tranquil Northern Coast of Cozumel. 2 level, 2 bedrooms, 2.5 baths, furnished very quiet condo in the Country Club Estate subdivision with ocean access for long walks along the ocean. Small oceanview from upstairs bedrooms. The master bedroom has a bay window with seating area and desk for an office with great light and nice views. This building has a beautiful upstairs rooftop terrace with killer ocean views!!! 127.98 m2 or 1400 s.f. 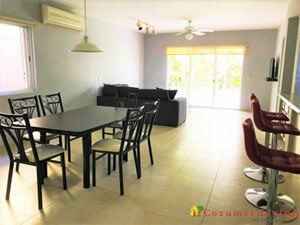 VILLAS TORTUGA #7 "Condo Mare"
Affordable Cozumel! Great Starter Home! New listing, airy 2nd floor unit, with lots of light and a nice view. Vaulted ceilings, 2 bedrooms and 2 full baths. Unfurnished. 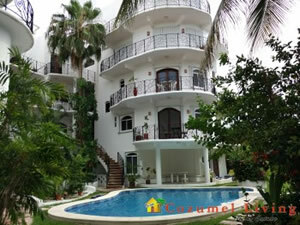 The building has a full time gardner, security gates and a beautiful pool, with chaise lounges and a common palapa area. 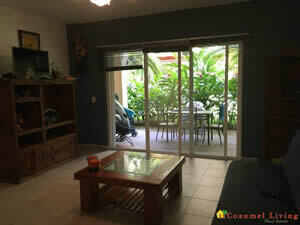 Located in Independencia, just a few blocks from 30th avenue with restaurants and shopping. Low monthly maintenance dues to care for the pool and grounds. 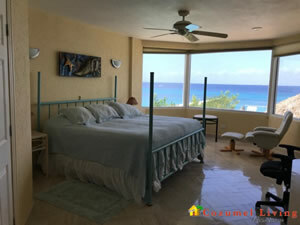 Las Ventanas is conveniently located one block from the ocean in Downtown Cozumel, walking distance to restaurants, shops, nearby supermarkets and nightlife. This 3 bedroom, 2 bath unit is located on the ground floor, with a lush tropical garden that gives it’s patio area privacy. This unfurnished unit has some great upgrades like it’s stainess steel counter tops and bowl sinks. 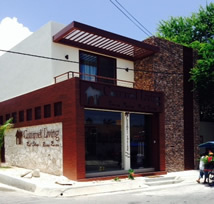 A perfect place to call home in Cozumel’s only downtown gated community. Located 1 minute from the airport, this exclusive development consist of 6 nice and modern loft villas displayed around a green area with luxurious pool. The large windows provide lots of natural lighting and a view to the pool and garden areas. Each unit has its own gated parking space. All units come semi furnished with kitchen cabinets, fridge and stove, bathroom cabinets, washing machine, A/C unit, celling fans and T.V. VILLAS 1, 2 ARE STILL AVAILABLE! This beautiful condo sits less than 100-feet (33 meters) from the oceans edge and minutes from the Palancar reef system, well known to scuba divers and snorkelers around the world. 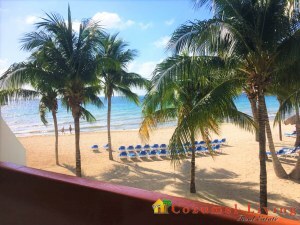 Tropical Caribbean 2 bedroom vacation rental condominium with oceanview, and heated pool on the first level veranda directly in front of the walkway to the ocean and main swimming pool. There is also a swimming pool directly to the north of the condo. Special details/information: 5 star rating, lock box to show, Full time maid can come with the property (owner will pay finiquito to terminate employment with him so you can start fresh) Also the same with the Property Manager. All advertising sites will transfer with sale. Annual propert taxes of $950 USD/year. Located just steps from the beautiful sandy beach within the Mediterranean styled Country Club Estates. Second floor Fully furnished 1 bedroom and 1 bathroom condo features a living room, dining room and kitchen along with a balcony in the bedroom. The units share the rooftop bar, grill, pool, common area and off the street parking. Conveniently located right next to golf course and a close drive to downtown. Newly furnished! 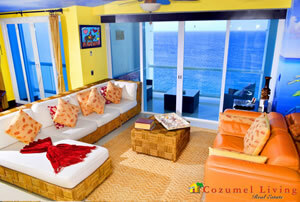 Peninsula Grand is not just a building, it is a lifestyle like no other on Cozumel. A true blend of condo and resort living. This amazing oceanfront property offers valet parking, on site chef, 24 hour security with doorman, high end gym with an ocean view, steam room, saunas, infinity pool – all of the amenities that you would expect in a 5 star resort. The 3 Bedroom, 4 Bathroom 7C unit offers the luxury that you would expect in Peninsula Grand. Granite countertops, custom made cabinets, LED lighting, energy efficient ACs, hot water on demand, marine quality ceiling fans, custom made and high end furniture, flat screen TVs, and a list of upgrades that goes on and on…. All of this impeccably maintained and offered to you, turn-key, ready to make this your Island home, with style. Check out the virtual walk through!